pV diagram of Carnot cycle. The area bounded by the complete cycle path represents the total work that can be done during one cycle. 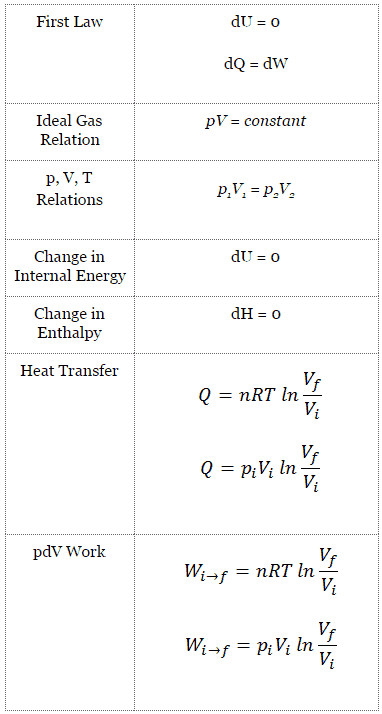 The second law of thermodynamics places constraints upon the direction of heat transfer and sets an upper limit to the efficiency of conversion of heat to work in heat engines. 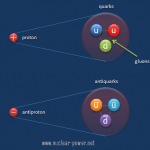 So the second law is directly relevant for many important practical problems. In 1824, a French engineer and physicist, Nicolas Léonard Sadi Carnot advanced the study of the second law by forming a principle (also called Carnot’s rule) that specifies limits on the maximum efficiency any heat engine can obtain. 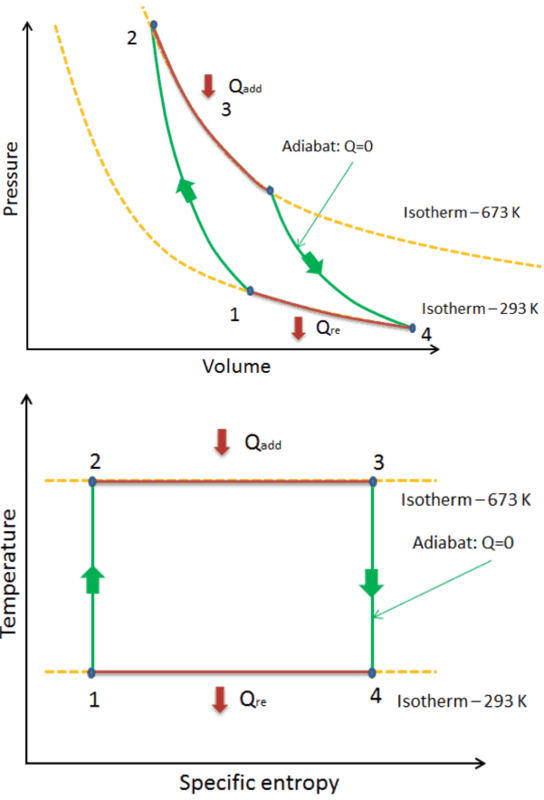 In short, this principle states that the efficiency of a thermodynamic cycle depends solely on the difference between the hot and cold temperature reservoirs. The cycle of this engine is called the Carnot cycle. A system undergoing a Carnot cycle is called a Carnot heat engine. 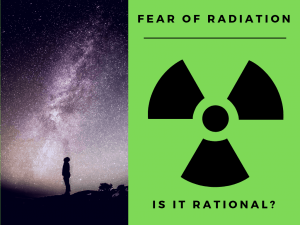 It is not an actual thermodynamic cycle but is a theoretical construct and cannot be built in practice. All real thermodynamic processes are somehow irreversible. They are not done infinitely slowly and infinitesimally small steps in temperature are also a theoretical fiction. 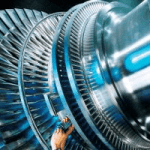 Therefore, heat engines must have lower efficiencies than limits on their efficiency due to the inherent irreversibility of the heat engine cycle they use. 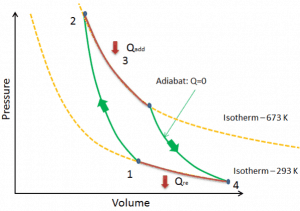 isentropic compression – The gas is compressed adiabatically from state 1 to state 2, where the temperature is TH. The surroundings do work on the gas, increasing its internal energy and compressing it. On the other hand the entropy remains unchanged. isentropic expansion – The gas expands adiabatically from state 3 to state 4, where the temperature is TC. The gas does work on the surroundings and loses an amount of internal energy equal to the work that leaves the system. Again the entropy remains unchanged. Ts diagram of Carnot cycle. 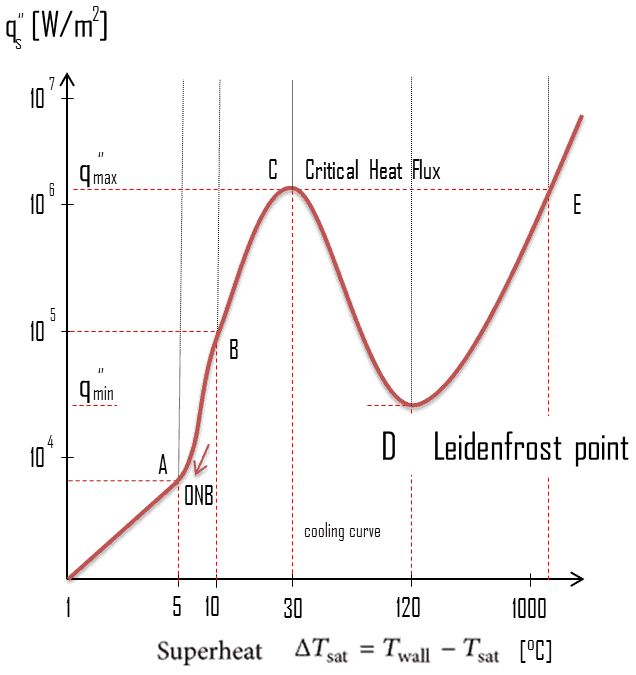 The area under the Ts curve of a process is the heat transferred to the system during that process. 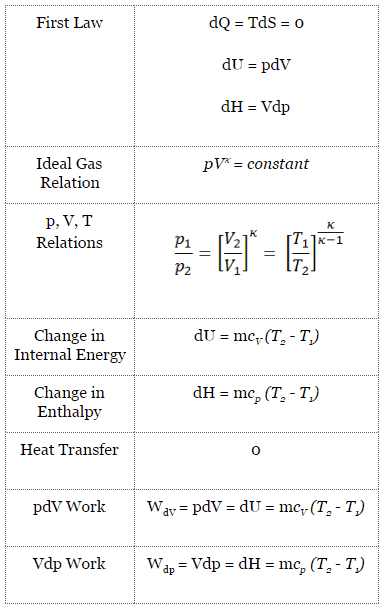 The Carnot cycle is often plotted on a pressure- volume diagram (pV diagram) and on a temperature-entropy diagram (Ts diagram). 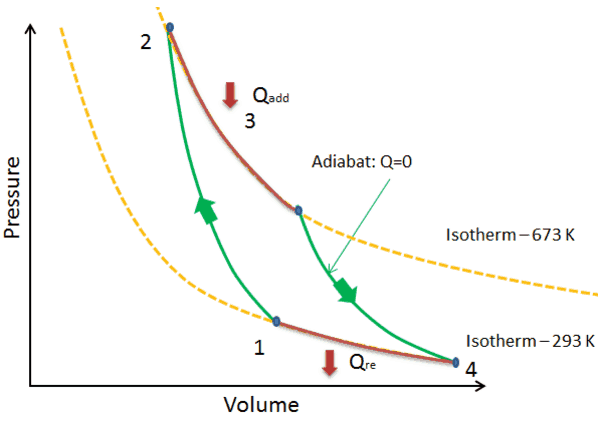 When plotted on a pressure-volume diagram, the isothermal processes follow the isotherm lines for the gas, adiabatic processes move between isotherms and the area bounded by the complete cycle path represents the total work that can be done during one cycle. The temperature-entropy diagram (Ts diagram) in which the thermodynamic state is specified by a point on a graph with specific entropy (s) as the horizontal axis and absolute temperature (T) as the vertical axis, is the best diagram to describe behaviour of a Carnot cycle. It is a useful and common tool, particularly because it helps to visualize the heat transfer during a process. For reversible (ideal) processes, the area under the T-s curve of a process is the heat transferred to the system during that process. 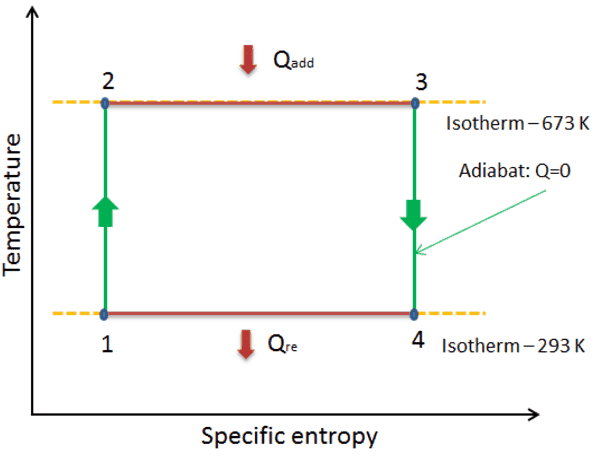 In general, the thermal efficiency, ηth, of any heat engine is defined as the ratio of the net work it does, W, to the heat input at the high temperature, QH. TH is the absolute temperature (Kelvins) of the hot reservoir. It must be added, this is an idealized efficiency. The Carnot efficiency is valid for reversible processes. These processes cannot be achieved in real cycles of power plants. The Carnot efficiency dictates that higher efficiencies can be attained by increasing the temperature of the steam. This feature is valid also for real thermodynamic cycles. 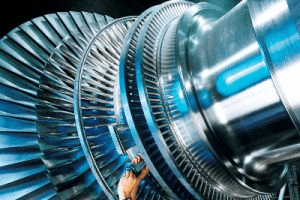 But this requires an increase in pressures inside boilers or steam generators. 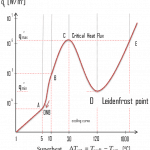 However, metallurgical considerations place an upper limits on such pressures. Sub-critical fossil fuel power plants, that are operated under critical pressure (i.e. 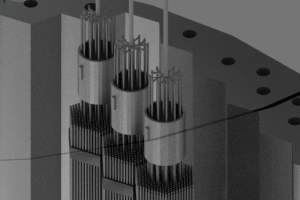 lower than 22.1 MPa), can achieve 36–40% efficiency. 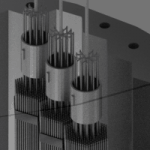 Supercritical designs, that are operated at supercritical pressure (i.e. greater than 22.1 MPa), have efficiencies around 43%. Most efficient and also very complex coal-fired power plants that are operated at “ultra critical” pressures (i.e. around 30 MPa) and use multiple stage reheat reach about 48% efficiency.